February Games with Gold Features Assassins, Demons and Jedi | Nerd Much? It’s the end of the month, so Microsoft has arrived to detail what’s next for their free games slate. And the February Games with Gold roster is bolstered by the Castlevania-esque, Bloodstained: Curse of the Moon. Bloodstained: Curse of the Moon comes to us from the legendary Castlevania alum, Koji Igarashi. Just as his pedigree would have you suspect, the title plays very similarly to an old school Castlevania side-scroller. It only released back in May, but it was revered by fans of the genre once they got their hands on it. As Zangetsu, a demon slayer out for revenge, you’ll adventure across hazardous environments on your quest to eliminate your ultimate target residing deep within a dark castle. The Xbox One version of Bloodstained: Curse of the Moon earned a 70 on Metacritic, which is odd considering the PlayStation 4 and Nintendo Switch versions held scores in the 80s. Regardless, the title is a solid addition coming your way via Games with Gold. It’s free to download from February 1st through February 28th. Also coming to Xbox One this one Super Bomberman R. It’s a great party alternative to the single-player Bloodstained. But the action puzzler didn’t really resonate with critics when it released back in June. It currently holds a 63 on Metacritic. You can download Super Bomberman R from February 16th through March 15th. And hey – you can play as Master Chief too! 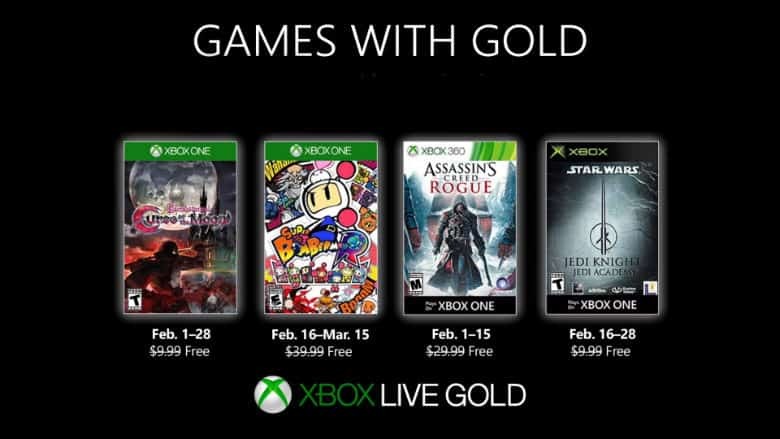 The February Games with Gold lineup also includes Assassin’s Creed Rogue for both Xbox 360 and Xbox One. Rogue was one of the more underwhelming Assassin’s Creed titles. It plays very similarly to Black Flag with its naval adventuring. But the final Creed title for last generation systems just didn’t wow with the next generation looming. The title is free to download from February 1st through February 15th. We also have an original Xbox game this month in Star Wars Jedi Knight: Jedi Academy. In it, you’ll play as a new student recently enrolled in Luke Skywalker’s Jedi Academy. And you’ll eventually face a choice that comes to many – light side or dark? Make your choice while the old school Star Wars game is available February 16th through February 28th.